BEFORE: Bay Area Bin Support arrives, bins often look like this picture below. AFTER: Bay Area Bin Service ensures that all bins are organized and overflow is placed properly in the bins prior to moving to the curb. To address that absent cleanup service, the Bay Area Bin Support team includes it at every push/pull site. Team members pick up any debris on the floor and put it inside the appropriate bin. 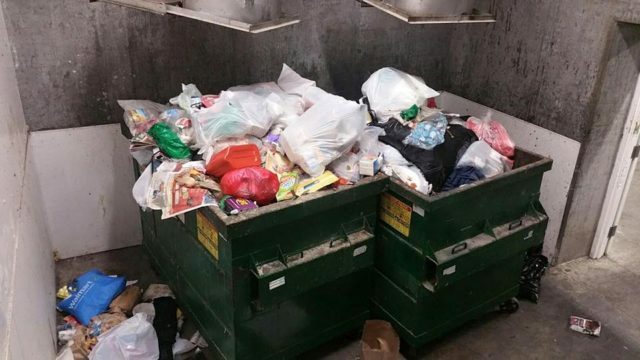 Trash is pushed down as much as possible to avoid overflow charges. The dumpster areas are swept, cleaned up, straightened up and left free of debris. 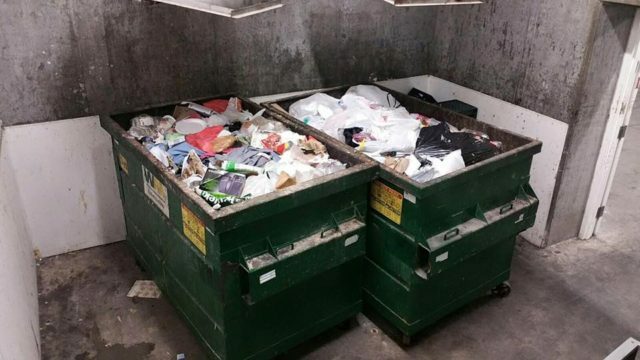 The Bay Area Bin Support team also closes the garbage chutes while the bins are out on the curb and opens them up after the bins are back in place. Did you know that your local garbage company might offer a couple of free bulky pick-ups a year for large items? Or that you have several garbage bins but only a few are getting filled each week? Perhaps you would benefit from an additional compost/organics containers for your tenants. A bin service company such as Bay Area Bin Support is in the business of understanding the garbage industry and the local regulations to help customers benefit from certain services. Since they are on your property each week, they can relay back to you whether you need additional (or less) containers on the property to improve efficiencies. They will also communicate any issues or concerns so that they can be addressed properly. In addition, Bay Area Bin Support can post signage in the dumpster areas to help residents know what items should go in landfill, organics and recycle which can also help reduce your trash volume. With this local company, clients have access to a customer service representative 24 hours-a-day, 7-days a week and can call at any time to troubleshoot any garbage issues on the property. Interested in learning more? Call us at 1-888-920-2467 for a free estimate. Landlords and property managers know very well that garbage can bring its own set of challenges and headaches for the properties they manage. From missed pick-ups, overflowing trash, messy trash enclosures to the ever-increasing fees appearing on the monthly bills. A new service is now alleviating these problems for landlords and property managers – Bay Area Bin Support is the San Francisco Bay Area’s first push/pull bin service company specializing in bringing trash, recycle and compost containers out each week for property managers and then placing them back in place after they have been serviced. Why should landlords and property managers consider hiring a vendor for this very niche service? In 2015, Oakland was the first to feel the huge impact of “push/pull” fees when the new garbage contract took effect. Suddenly to have the garbage company pull a bin over 100 feet to the curb to be emptied was going to cost the property owner/manager almost a $1,000 per month, per bin! Check out this PDF from Oakland Recycles for a detailed explanation. Bay Area Bin Support saves its customers nearly 75% for the same service. In other cities, the manual labor of bringing dumpster bins and carts to the curb might be labeled backyard service, distance fees, elevation fees but the end result is the same – expensive additional fees on the monthly garbage bill to have the garbage company bring your trash out to the curb. These fees are in addition to the actual cost of dumping the garbage. In most cases, locally-operated Bay Area Bin Support charges significantly less for the same service. The company specializes in push/pull service and offers a flat fee regardless of the distance to the curb. There are no additional key charges, elevation fees or other extra fees. BABS workers start their routes early in the morning before the garbage company and have everything (garbage, recycle and compost/organics) out to the curb in time for service. The end result is usually significant cost-savings for property managers, owners and landlords. Interested in learning more? Call us at 1-888-920-2467 for a free onsite estimate.